JEWISH COMMUNITY MINISTRY (JCOM) – SEDER DINNER VOLUNTEERS MEETING THIS WEEKEND MARCH 23-24 – SATURDAY AFTER SERVICE AND SUNDAY AFTER 2ND SERVICE - CHILDREN’S MINISTRY ROOM 115/116: Please come to one of the meetings if you would like to help out with this year’s Passover Seder Dinner on Friday, April 19th. We need at least 50 volunteers. More info: Matt McDaugale at . PASSOVER SEDER DINNER – TICKET SALES BEGIN NEXT WEEKEND MARCH 30-31: The Jewish Community Outreach Ministry (JCOM) will start selling tickets for the Passover Seder Dinner next weekend before and after each service at the Ministry Center. The cost is $20 per person. More info: Cathy McDaugale at . CHANGE FOR CHANGE – COIN CUPS AVAILABLE: Pick-up a special cup to gather your change for our upcoming Philippines Mission Trip that will fund a ministry retreat for missionaries and local church servants in the Philippines. Drop off your change at the designated Change 4 Change area in Foyer. LOOKING FOR AN OPPORTUNITY TO SERVE IN THE NEW YEAR? 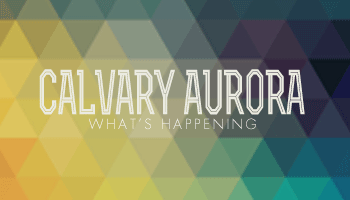 There are many different opportunities for you to serve here at Calvary. Pick up a ministry application at the Welcome or Ministry Center today! THE GROVE YOUNG ADULTS MINISTRY – MEETS TUESDAYS & FRIDAYS: Are you between the age of 18 and 30? Get connected! Join us for a time of fellowship, prayer, worship, and Bible study on Tuesday and Friday nights. For more info or questions email . 89.7 GRACEFM LIVE CALL-IN SHOW – MONDAY-FRIDAY FROM 4-5 PM: Questions about the Bible? Prophecy? The Holy Spirit? Life? “Calvary Live”: 303-690-3000 or Text in your questions or prayer requests to 720-336-0897. GREAT THINGS! RESURRECTION WEEKEND 2019: Join us for one of our family services. Saturday, April 20 at 4 pm & 6 pm and Sunday, April 21 at 6:45 am, 8:45 am and 10:45 am. MISSIONS PRAYER: Pray for Deneen Kelly as she shares the gospel with women who have been trafficked in Thailand. Email words of encouragement to .